While the blog has seemed to linger in hibernation, know that there are stirrings about and things to come. However, while completely lost in about seven brazillian projects I’m working on, I got word that this month Mixology Monday was going all Tiki. How could I resist submitting one of my current projects for consideration – especially when our esteemed host, Mr. Winship over at the Pegu Blog, accosted me via email for not having submitted an entry yet? Back when I first started working on creating my own cocktail recipes with the help of the people at the Mixoloseum, I came up with a drink called the Absinthe-Minded Professor. The original called for the use of Mata Hari Absinthe, who was the sponsor for that evening. The only problem I had with the drink was that Mata Hari Absinthe wasn’t that common and – critically- wasn’t really a typical absinthe. Where Mata Hari was herbal and like a darker Chartreusian relative, most absinthes are very strong with anise flavors that the Mata Hari lacked. It made the drink feel like something of a misnomer. Combine all of the above with 1/2 cup of crushed ice in a blender and flash-blend for 6 seconds. 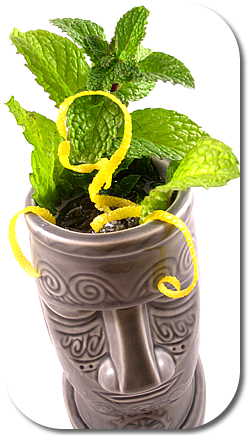 Pour into a tiki mug, top with crushed ice, and float blackstrap rum. Garnish with mint. The result is decidedly more “absinthey” than the original beverage. In my most recent test I used Herbsaint Absinthe and Smith & Cross Jamaican rum as the base and was pleased. So I submit this to MxMo for commentary. Is this drink complete? Am I completely nuts? Should I ditch the blackstrap float and just go for a full ounce of Lemonhart 151? Should I just stop now and go back to not posting? It’s really nice to still be able to read about Absinth based Cocktails… Become rare.